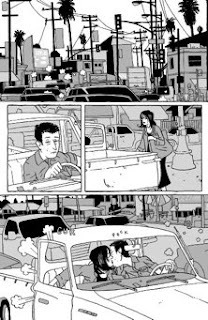 Issue #3 of Jordan Crane’s Uptight serves as a wonderful example of just how good pamphlet format comics can be. In a climate where independent publishers are shying away from single issues, it’s heartening to see something like Uptight in the racks, raising a defiant middle finger to the financial downturn. Housed in an eye catching wrap around cover, Uptight #3 delivers 24 pages of beautifully focused storytelling. Stylistically, the two pieces in Uptight #3 couldn’t be more different, with Crane pitting a sombre tale of infidelity against a whimsical all-ages adventure romp. 'Vicissitude' opens the book, and relates the story of a disintegrating relationship in remarkably terse fashion. When Leo receives an accidental phone call from his girlfriend Dee, he begins to suspect that she may be cheating on him. As we flit between the two characters, it soon becomes apparent that Leo's suspicions aren't without substance. We're privy to both Dee's passionate rendezvous with her lover Pete as well as Leo's growing distrust. Crane skilfully exploits the fact that we, as readers, have the benefit of both sides of the story and makes striking use of body language to communicate the emerging cracks in their relationship. Crane’s cartooning here is nothing short of brilliant, and frequently operates purely in the realms of the static image, requiring little more than a well timed downcast glance or a passionless peck on the cheek to advance the narrative. His expressive line work does a good deal of the leg work, with much of the exposition implied rather than spelt out for the reader. With such a rich visual approach there's little need for superfluous captions or an over abundance of dialogue. Reading 'Vicissitude', I found myself becoming increasingly obsessed with Crane's page layouts. Drawn in by the consistent regimented beat of the thing, I found myself marvelling at his subtle permutations of the six panel grid. When I began to compare adjacent pages, I soon discovered that certain pages mirror each other, creating a recurring motif of sorts. For instance, on page nine, there's a clever little touch, whereby an open door segments the top right hand panel of the page, thereby creating the suggestion of a third panel, which in turn matches the layout of the previous three pages. All very clever. I can't lay claim to any grandiose theory regarding the page layouts, but I do find it an intriguing structural curiosity, one which adds credence to my belief that this is very well thought out work indeed. Crane's abilities as a skilled draughtsman have never been in question, but 'Vicissitude' does much to illustrates his talent for highly compressed narrative structures. In many ways, Uptight #3 feels like the comics equivalent of a rather eclectic split 7" single, with 'Freeze Out' acting as the light hearted pop B side to the altogether darker A side. When the metaphorical change of sides does occur, it's a welcome shift in style, one which does much to counter the somewhat sombre tone of the previous story. 'Freeze Out' marks the return of the cast of The Clouds Above and picks up exactly where that book left off, delivering a good healthy does of the same good natured, wide eyed adventure. Simon, along with his trusty cat and newly acquired sidekick Rosalyn, embark on a quest to rid the school's freezer of a monstrous, not to mention hungry, blockage. A perilous expedition to be sure... one which will delight kids as much as it will adults. The art on display is particularly sumptuous, stuffed full of detail and gorgeous spiralling line work that snakes and curls across the page with a wild fluid grace. I must admit to missing the vibrant colouring of the original book somewhat, but it's but a very minor complaint, especially considering the sheer quality of the material on offer here. If you like Crane's work or simply want to try something a little different, do go out and buy this. Uptight represents everything single issue comics should be but so very rarely are. Fact is, we need more comics like this, so vote with your wallets and support the fine folks at Fantagraphics, that way we’ll be more likely to see future instalments of this excellent series.